Figure 1. Erosion corrosion damage to copper tube. Figure 2. Damage showing distinctive horseshoe-type pattern downstream of elbow. Normally copper tubing used in residential and commercial plumbing installations is considered quite corrosion resistant. 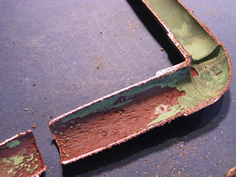 Under certain situations, however even copper can suffer from progressive corrosion damage; one such phenomenon is known as erosion corrosion. This damage starts at the inside surface of the tube and progresses outward, and as the name describes, it is caused by a combination of material removal under the action of a flowing fluid (water) – erosion, and chemical attack to the material from its environment – corrosion. 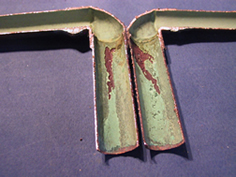 Figure 1 shows typical internal damage to a piece of ½ inch diameter copper tube; this tube had been in service for only a short period of time. Damage to the tube initiates from the inside and grows outward until finally breaking through the tube wall and causing a leak. As shown in Figure 2, the damage exhibits a distinctive horseshoe-type pattern with the legs of the horseshoe pointing downstream in the flow. The most significant factors that contribute to erosion corrosion damage are water chemistry, temperature and velocity, as well as the plumbing system duty cycle (how much it is used). The most demanding duty for a plumbing system is most often found in an hot water recirculation loop; here the duty can be 24/7 compared to the relatively infrequent usage of standard fixtures such as showers, lavatories, dishwashers, etc. Water that is high in total dissolved solids and low in pH, calcium hardness, and total alkalinity is considered aggressive to copper tubing. Typical thresholds for the onset of damage with non-aggressive water are 8 feet per second for cold water, 5 feet per second for hot water up to 140 degrees Fahrenheit, and 2 to 3 feet per second for hot water above 140 degrees Fahrenheit. For example, a standard 2.2 gallon per minute kitchen faucet demands a flow velocity of 2.8 feet per second in standard ½ inch diameter Type M copper tube; this is well below the threshold for typical hot water temperatures in residential use. It is interesting to note that for thicker wall copper tube, the threshold for damage decreases; using the same example as above, the velocity demand increases to 3.2 feet per second for thicker Type K copper tube.